If you have a lift/Elevator on site in either your public or private building, to comply with BS 7255:2001 which is the code of practice for safe working on lifts you will need to ensure that you have the correct signage in the area of your lift shaft or lift environment. JH Signage’s signs have been designed to make your business life simple and fuss free . JH Signage have committed themselves to having an ‘open house policy’. This enables you to browse freely through our extensive range of products without the need for any entry codes or logins. Giving you complete access to all our products, pictures, and most importantly FAIR PRICES! 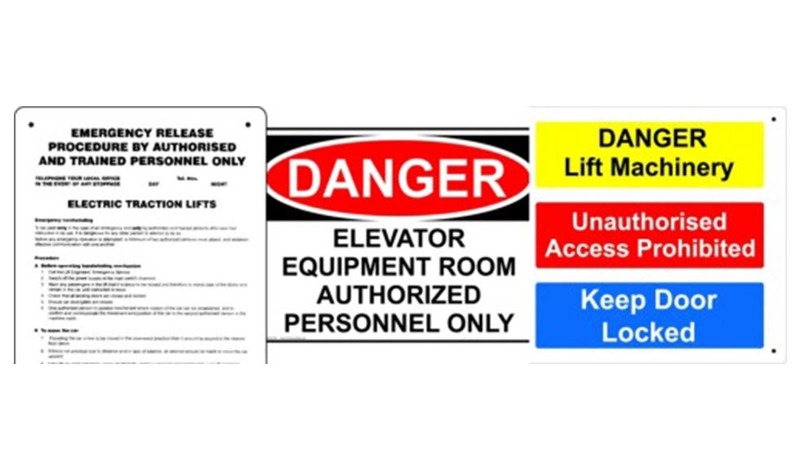 We offer Elevator Signs such as ‘Hand Winding Instructions / Hydraulic Lifts Emergency Release Notice’, ‘Danger, High Voltage’ and many more in various styles and durable material’s to post at every elevator entrance or stairwell. Browse our selection of safety signs and order yours today! Should you require any further assistance then please do not hesitate to contact our team on 0207 252 0118.